The Mirage Hotel Las Vegas is the perfect medium price ranged location you are looking for while in Las Vegas. The Mirage Hotel Las Vegas is great for many different age groups and families looking for that oasis in the desert. There are plenty of green areas on this complex that transport you to the islands of the South Pacific. The pool area is fabulous with waterfalls, lagoons and plenty of room to sun. 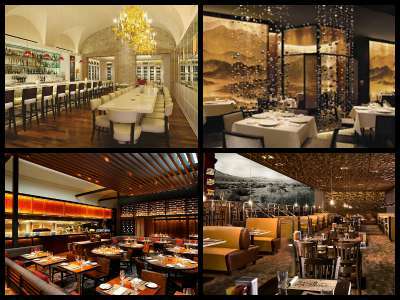 Dining at the Mirage is ideal for anyone’s budget with such standouts as the Heritage Steak by Tom Colicchio or California Pizza Kitchen. The rooms and suites have been updated over time and offer relaxing choices in many different layouts as well as size. The casino is large but not so large you will get lost but the race and sports book is one of the larger in Las Vegas. 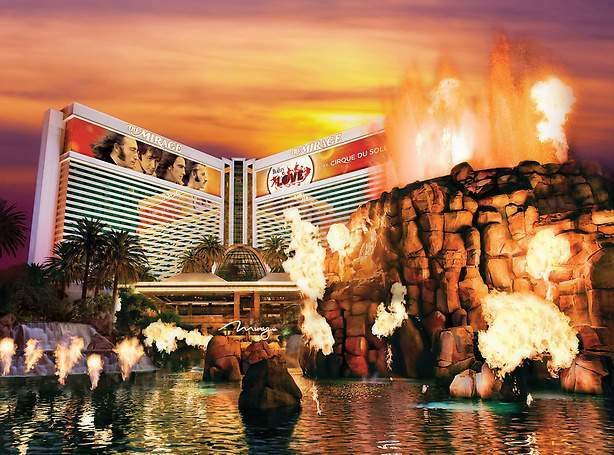 The multiple attractions at the Mirage include an erupting volcano, an aquarium and swimming dolphins that are a must see. Overall the Mirage is an oasis of pleasant surprise while vacationing in Sin City. The Mirage Hotel Las Vegas complex offers a variety of rooms and suites that will allow you to relax before and after you visit the lush gardens throughout the complex. The Resort King and the Resort Tower King have similar setups with a spacious feeling that includes a sitting area by the window. The Tower King has a bigger bathroom with dual vanity sinks and a separate tub and shower unit. The Resort King has a smaller bathroom with a standard tub and shower combination. The Resort Queen sacrifices the sitting area for the additional queen bed. 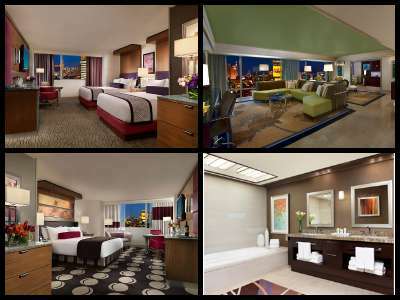 Suites at the Mirage Hotel Las Vegas were creating for comfort, entertaining and relaxation. The Mirage Suite is 800 plus square foot of luxury space with a king size bed and excellent foyer area. There is a large sitting area complete with an entertainment center as well as a sleeper sofa. There are also two full bathrooms-one with an over-sized tub and the other with a shower. The Hospitality Suites are over 1,700 square feet with two bedrooms, one with a king size and the other with two queen size beds. Each bedroom also has its own bathroom with an oversized tub and shower. There is a separate living space that includes a sitting area with entertainment center, dining room table and a kitchenette making this very functional for entertaining and for families. There is even a half bathroom near the front entry. The Tower Suites located on upper floors of the complex offer spectacular views with their floor to ceiling windows. The décor is urban sleek and the one bedroom is 1,251 square feet. There is a sitting area in the master, a separate living room with a sectional couch, a dining room table and a wet bar. The bathroom has an oversized soaking tub, a dual sink vanity and a separate shower. The two bedroom Tower Suite is over 1,600 square with the same amenities as the one bedroom suite- with the exception of an additional bedroom with a smaller attached bathroom. There is a VIP elevator that will take you to the Penthouse Suites at the Mirage Hotel Las Vegas. These have a very modern attitude in décor and are similar size as the Tower Suites with an identical one or two bedroom layout too. What will separate the Penthouse Suites is the spectacular view. 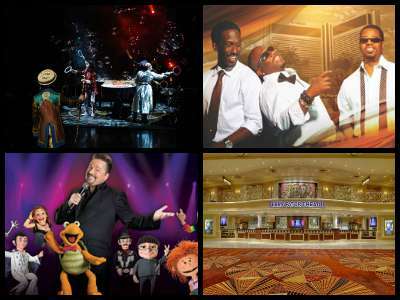 The marquee entertainment at the Mirage Hotel Las Vegas features an excellent variety for everyone. The Beatles LOVE show is an interesting take on the Beatles and their music presented by Cirque du Soleil; Terry Fator, of America’s Got Talent fame, performs a show filled with celebrity impersonations, comedy and singing; the iconic Boyz II Men musical group perform their favorites in an intimate setting; the Aces of Comedy features such greats as Jay Leno, Ray Romano and Tim Allen grace the stage. The Mirage Hotel Las Vegas has an interesting nightlife that includes twelve different bars and lounges, each with its own distinct character. A person might just want a casual drink from the Lobby Bar, the Dolphin Bar or just visit with friends at the Sports Bar. You can visit the Heritage Steak Lounge and indulge in the comfortable seating; the Japonais Lounge is very modern in décor; the Portofino Lounge is lavish elegance for that pre or post dinner cocktail; retreat to the High Limit Lounge for a signature cocktail while watching or playing no-limit stake games; the Stack Lounge offers DJs on selected nights and the Bare Pool Lounge allows you to let it all hang out. 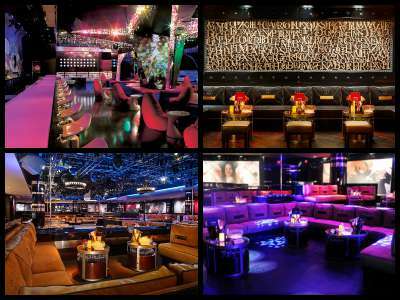 The Mirage Hotel Las Vegas complex has three high energy nightclubs that are sure to please. The RHUMBAR boasts an exotic Caribbean feel with signature frozen beverages; the Beatles REVOLUTION is filled with fun retro décor of the 60’s and 70’s as well as the Abbey Road Bar; the most acclaimed nightclub is 1 OAK that is fashioned after the original in New York City. The casino area at the Mirage Hotel Las Vegas complex is over 100,000 square feet that offers gaming from blackjack to poker to an abundance of slot machines to roulette. The atmosphere is filled with neon and high energy. 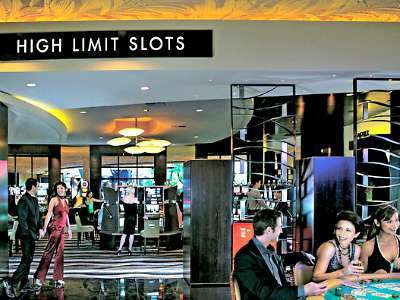 There is a separate area for high limit games that adds a sense of class. The 269 seat race and sports book is one of the largest in Las Vegas and is accented by a huge 48 foot viewing. There is a wide variety of restaurants located within the Mirage Hotel Las Vegas complex that will fit just about any budget or dining mood. On the casual side, try the 24-hour Pantry which serves up everything a diner needs too; BLT Burger and BLT TO GO which offer burger creations from Chef Laurent Tourondel; Carnegie Delicatessen serves up traditional East Coast deli sandwiches and other eats; the California Kitchen Pizza offers wood fired pizza and for a sweet tooth try BLIZZ Frozen Yogurt. Chef Tom Colicchio’s Heritage Steak is designed by Bentel+Bentel highlighting natural materials in the décor and offers perfectly prepared steaks over charcoal; FIN is an elegant experience of Asian décor and tasty Chinese cuisine; fashioned after locations in New York City and Chicago the Japonais puts a new twist on Japanese cuisine; the STACK features upscale cuisine that is taken to a new level; Samba Brazilian Steakhouse is a meat lovers paradise with its Rodizio style eating and the Portofino is an excellent choice for elegant Italian dining by Chef Michael LaPlaca. 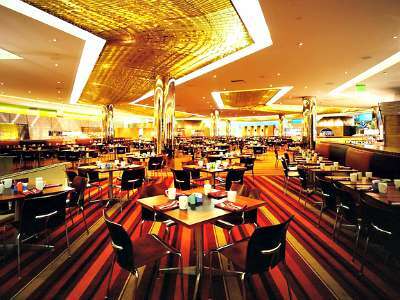 Craving Buffet restaurant is the ideal spot to enjoy excellent cuisine at your own paceat the Mirage Hotel Las Vegas. There are no worries about satisfying the family’s appetite with the numerous food choices. Cravings Buffet offers different stations of varying cuisine from breakfast, brunch (yes even during midweek) and dinner. The many dishes are prepared with fresh ingredients by quality chefs. There is also an unlimited beer and wine option as well as a champagne brunch on the weekends. 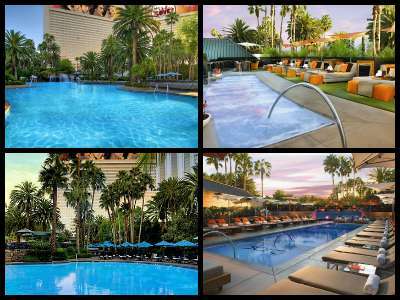 The pools at the Mirage Hotel Las Vegas leave you feeling like you are visiting the South Pacific. With lots of waterfalls and private lagoons that feature plenty of green space. There is ample area to relax and there are private cabanas as well as day beds available for rent. The Paradise Café is located near the pool for all of your food and drink needs. The Bare Pool Lounge is the perfect area to experience European style sunbathing. Very little is kept unseen at this secluded pool and you must be 21 years of age or older to enter this area of tropical surroundings, sleek urban cabanas and skin. There are not many hotels on the Strip that offer entertainment that rivals the Mirage Hotel Las Vegas. Four such attractions standout above the rest and they are the Volcano, Aquarium, Atrium and the Siegfried and Roy’s Secret Garden and Dolphin Habitat. The Volcano is where the fun starts. You will feel the rumble, see the fire and lava as well as sense the heat on your skin when this giant mountain explodes. The volcano erupts several times during the day and night, so make sure you check the schedule. The Aquarium is a 20,000 gallon saltwater tank that is filled with creatures of the sea in an artificial coral reef setting. The viewing area is sleek and the tank is perfectly located at eye level. This is the second generation of the Aquarium. The first tank was donated to the Las Vegas Natural History Museum. 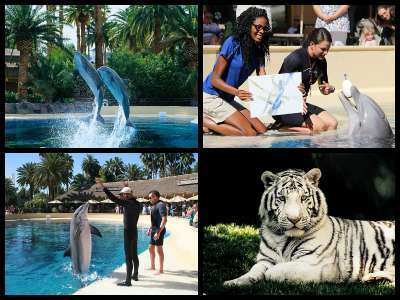 An interesting attraction in Sin City is the Siegfried and Roy’s Secret Garden and Dolphin Habitat. This venue is an excellent choice for viewing some of the world’s rarest and intelligent animals. There are several packages and tours available such as VIP, Painting with the Dolphins, Trainer for a Day and even Yoga with the Dolphins. Each package includes viewing other animals like the signature white tigers which have recently revealed a set of four new cubs. The Mirage Hotel Las Vegas has some of the most coveted space in Las Vegas for weddings. There are several ceremony packages and venues that stand apart from the rest of the Strip. The Mirage volcano offers an interesting backdrop for your vows and will delight your guests with a showering of flames and lava. The four different volcano packages are perfect for that 30 guest or less ceremony. The ceremonies around the Mirage Pool are spectacular with waterfalls and lagoons as the backdrop. There are also four packages to choose from that can accommodate from 30 to 150 guests. In addition to the tropical scenery you can also get married at the Dolphin Bar. The Tropical ceremony packages offer a quiet garden setting filled with lush green plants. There are also private marriage venues at the Mirage that offer all of the intimacy and luxury that a couple desires on their wedding day. If one of the fabulous packages does not fit your taste the expert wedding planners can accommodate all of your wishes. 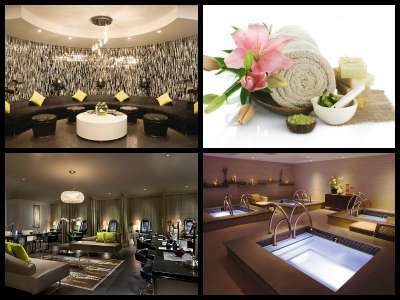 The Spa and Salon at the Mirage Hotel Las Vegas is 20,000 square feet that will help reenergize your body and spirit. There are multiple options to choose from with their packages or you can mix and match many different treatments. The personalized services from the attendants will make you feel like a king or queen of your own island. The salon is packed with such great services as facial and manicures as well as offering the trendiest in hair design. Try the Chakra Balancing treatment for an amazing experience. 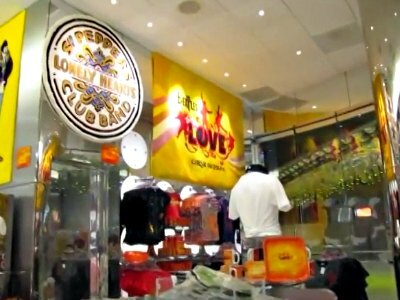 The shopping at the Mirage Hotel Las Vegas complex starts with the Beatles Shop. This is the only retail store in the world that is licensed to sell anything and everything about the iconic Beatles; there are designer fashions available at either the Paradiso or the Misura; the Watch Boutique is filled with the accessories for both men and women as well as watches in all price ranges; the Art of Music is loaded with memorabilia from the past and present representing film, music, TV and sports industries and there are four unique gift shops in the Essentials, Essentials II, Dolphin Shop and the Secret Garden that can provide you with all the necessary souvenirs. If you want that everlasting souvenir then visit the Starlight Tattoo which specializes in one-of-a-kind designs.